Happy New Year and I hope you were all able to participate in the recent Women’s Marches. 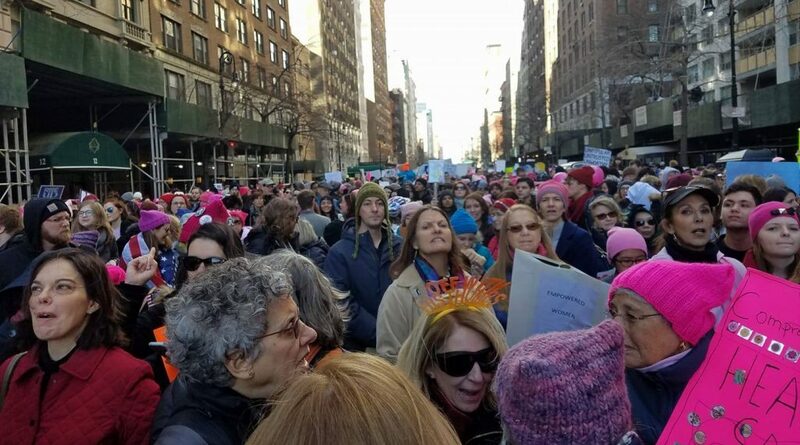 In NYC, the numbers were much larger than the stated 200,000, and thousands of people never got to actually join the march because the crowds were so big and due to NYPD crowd control. I was one, who after trying to enter the march from there different entrances, finally joined thousands of others marching down Columbus Ave. When I reached Columbus Circle, it too was barricaded off by the police, and the best I could was watch this sea of humanity slowly pass by. Like last year’s march, it was a good antidote to the misogyny, racism and anti-Muslim, anti-immigrant progroms being waged by the White House. The anti-Muslim travel ban is in effect, and ICE agents are raiding workplaces and snatching immigrants out of their homes and out of their scheduled appointments and sending them to immigration jails and deportations. And that’s just the tip of the iceberg. The government is threatening to impose work requirements for Medicaid (even as thousands of poverty-wage workers already qualify), and the new tax law will mean racist cutbacks in what’s left of the social contract. And unions are in the cross-hairs for a possible knockout blow. If there was a weakness to the march, I would say that in NY at least, the marchers were about 90% white. While it’s great so many people were out in the streets, we have to do better at reaching out to black, Latin, Asian and immigrant workers and youth, and address the issues of racist inequality, incarceration and police brutality if we’re going to get very far. Also, we have to think bigger than the ballot box and the mid-term elections, important as they may be. All of the past victories that are now being reversed, from unions to civil rights to reproductive rights and so much more, were the end result of mass, sometimes violent movements of workers and youth. And only when those movements rattled the corridors of power did “progressive” legislation follow. In my opinion, we need to rattle a lot more corridors. The politicians should follow the movement; the movement should not follow the politicians. Let me know what you think. Ebony: We’ve been to court twice and Ebony still hasn’t made a serious offer. The judge wasn’t happy and basically let everyone know that she wants this settled by our next court date, on Feb. 20. Our lawyers are talking to theirs, and we are trying to protect our members so that any settlement we reach is guaranteed and bankruptcy-proof. Uptown: This case of four writers, owed about $20,000, all in NYC, will be handled by the Volunteer Lawyers for the Arts. It’s a first step of a new relationship and new member benefit we can offer. As an institutional non-profit member, at $870/year, NWU members will have access to VLA services. As we’ve said before, these group NPG’s can be a major organizing tool for us. From these three grievances, we’ve gained more almost 70 new members. The hard part is maintaining them as members for the long run. But it is like gaining 70 new organizers because they all know other writers who are going unpaid or suffering late payments. Also, as these are straight breach of contract cases, we should have a high win rate, even if it takes time and the payments are dragged out. That too, will help send more writers our way. As more working writers become members, it will lead to changes within the union and to how we process these grievances. These are different from the individual grievances normally handled by GCD (and we have gotten very few of those lately). As mentioned above, this month NWU became a non-profit institutional member of Volunteer Lawyers for the Arts in NYC. The first fruit of this new relationship will be that VLA will represent four of our members in a breach-of-contract case against Uptown Magazine. But that’s just the beginning. I’ll be meeting with Amy Lehman, the Director of Legal Services for VLA, within the next few weeks and we will discuss building a real partnership. At the very least, we should be able to post to each other’s websites, and maybe schedule a couple of talks among their clients and our members, on this new relationship. Not only can we refer members to VLA, but VLA can also refer freelancers they are representing to the NWU. But all of this needs to be discussed, thought out, and a plan developed. I’m excited at the prospect because it is another member benefit we can point out to perspective members, and it increases our capacity to serve members in a very difficult time for freelancers. We have some good news to report. As you know our 10-year lease expires this spring. This has been a terrible burden on our budget. At the same time, our building has been sold (maybe the fourth owner since we signed the lease). Anyway, the four UAW locals who share a space have worked out a three-year lease extension with the new owner with a 10% reduction in our current rent. In addition, to save the hassle and expense of everyone having to move, Sister local 2320 (Legal Services) and local 7902 (NYU and New School Adjuncts) have each agreed to rent out 25% of our space. So our rent will be cut in half starting in May, which will finally give us some breathing room.